Are you planning your wedding in beautiful Marbella and want something a little less traditional and a bit quirky? 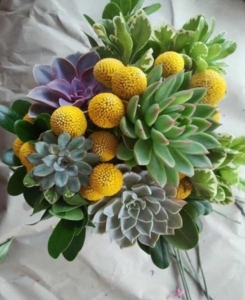 If you are searching for wedding bouquet ideas, then we can help you gain inspiration and ideas for truly unique and quirky wedding bouquets. Your wedding day should reflect your personality and this means from your choice of bridal gown, wedding cake, bridesmaids dresses and those all important wedding bouquets. Long gone are the days when bridal bouquets have to feature traditional flowers. Today wedding bouquets can be made of anything that you like. Below we share some of these ideas with you. Today when considering wedding bouquet ideas, then absolutely anything goes. 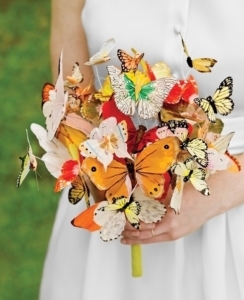 Bouquets can consist of colourful butterflies made from an assortment of paper or fine fabric. 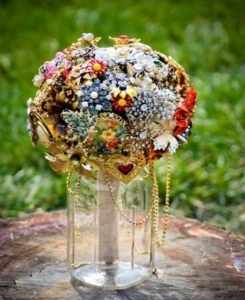 This type of bouquet is perfect for the wedding with lots of colour. Bouquets can also be made from an assortment of buttons or even seashells. If you still want to incorporate flowers into your bouquet, but want to create something a little bit different, then a bouquet that is made from giant paper glowers is quite stunning. The map flower bouquet is also an incredibly personal bouquet and can be made from maps of where you have been on holiday together or where you first met. 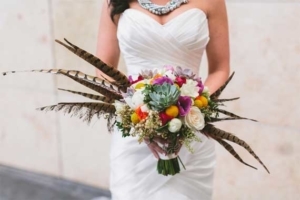 Other ideas for quirky bouquets include those made from brooches and feathers. All of the bridal bouquets can be handcrafted by the bride and are truly unique and special for a bride on her special day. A stunning bouquet featuring a sumptuous array of ivory buttons with mint green touches. This decadent bouquet features gorgeous pearls, diamante buttons and luxurious fabric flowers. This dome shaped bouquet is surrounded by a handmade lace petal collar and completed with a cream ruffle and mint green wrapped handle. Go hunting for vintage brooches, pins, and earrings at estate and garage sales, describing it as a scavenger hunt of sorts. Etsy.com is also a great resource for hunting down pieces. You’ll also need floral tape, craft wire, and silk flowers of your choosing. Wire each brooch and cover the wire with floral tape. Form the silk flowers into your desired bouquet shape. Scatter the brooches throughout the silk flowers. Cover the stems with vintage handkerchiefs, if you’d like. Use your grandmother’s cameo on the handle, which is a great way to honor a loved one. 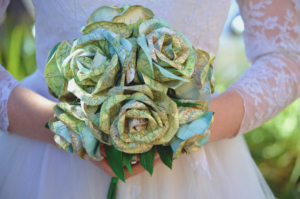 Made from ‘The Reader’s Digest Great World Atlas’, this bridal ‘bookquet’ will last forever, just like your marriage. Bound with a lovely green satin ribbon handle, this bookquet is light-weight & easy to hold. The busy bouquet made up of colorful roses, craspedia, succulents and feathers created an arrangement that Kaitlyn carried down the aisle. 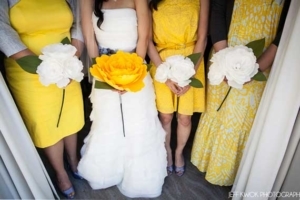 The vibrant shades definitely created a statement against her classic white wedding dress. Are you planning a Beach Wedding? 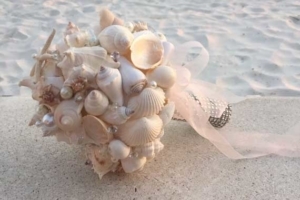 Here is an idea of a big pretty bouquet made with shells pearls and bling. Succulents are unquestionably stylish. 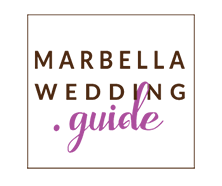 They work well as wedding favors, ceremony decor and our personal favorite -wedding bouquets. Succulents are found to be sprouting out all over a wedding scene, loved for its versatility and year-round availability. If you want a less conventional wedding with little florals as well, that can be boring. Make it something special with giant self made flowers!